What Software Tools do you Love? Hate? I am using Atom.io with about 10 community packages. Not a fan of Vim or Emacs. I also don’t want to pay $50/mo for Photoshop and Illustrator. Gulp and Webpack to make server run? Any suggestion where i should start learn them? I have used Polymer and it used both Gulp and Webpack (if i’m not wrong) to build (run) it. For gulp, I really liked this series from Level Up Tuts. Webpack I learned from Front End Masters while learning React. You can use webpack by itself but gulp is great for server stuff, sass/stylus, and testing (and much more). A couple of weeks ago I finally broke down and tried Visual Studio Code as an editor. I usually have an allergy to anything microsoft, but I’m really liking this editor. It’s free, open sourced, fast and an active extensions community. John Papa gives a decent overview course over on Pluralsight. Previous to Code I was using Brackets which I also really like. If you have not yet started using tools like Emmet in your editor then check it out. It’ll save you a ton of time setting up html pages. Bootstrap 4 is out and looking really good as are the improvements found in Angular 2. In fact, if you have not learned Angular yet, then just skip Angular 1 and start directly in Angular 2 as it will save you a lot of migraines and a ton of time. Hey @arowberry I know what you mean about the Visual Studio brand of IDE’s, they really are fantastic. Although I’ve been using WebStorm for quite a while now I did get a free copy of the full Visual Studio Ultimate 2010 while in school and I really loved using it. It does take a while to start finding your way around in it and organizing projects, etc., but once you get the hang of it, well, how to say it - “the force is with you!”. Be sure to try out Visual Studio Code which is in that sweet spot for web development that gives me a little more than an editor like sublime or brackets but is not the big heavyweight IDE of Visual Studio. I think microsoft could have come up with a better name for Visual Studio Code to distinguish it apart as a totally different editor from the huge expensive Visual Studio IDE. I mean, microsoft could have named VSCode something like Lightning or just about anything, but then I suppose that would not be as confusing, so they didn’t. I’m also am really liking the development tools of the new microsoft Edge browser which is also a totally different browser from the nightmarish Internet Explorer series of browsers. I’m glad they named Edge distinctly rather than something like, Internet Explorer Code. Here are my favorite software tools! I use Brackets editor,because it’s free and open source,there many great plugins.It’s easy to use.It’s my best text editor. Lots of people use Markdown or ReStructuredText for keeping personal notes, and there are plenty of tools for converting them to HTML, including entire static site generators for blogging. I use vim and git on Ubuntu 16.04 running the i3 window manager, and I use those to mostly write Go and some Python. I use the awesome vim-go plugin for vim. I also have a bunch of command-line tools I wrote myself that I use quite a bit. I can’t live without z. If you spend any significant time at a terminal, you need it. Here’s a demo video I made. Enjoy! I love using notepad++ as well! I have tried brackets, but I just can’t get use to it. In terms of software tools, I tend to use a mostly open source stack. My main OS of choice is Antergos,on my home machine and Manjaro on my travel rig. Both Linux distros are based on Arch Linux. Atom is my text editor of choice. Despite its speed issues (which are getting better) I feel it can safely stand toe to toe with Sublime Text in terms of plugins and functionality. For graphic creation / editing, I prefer to use GIMP, Inkscape and Agave, but I only use those on personal projects. When working with a team I still have no choice but to use Mac OSX and Adobe Products. For command line functionality I use a a lot of different tools. starting with oh-my-zsh. The reason I use it over the standard bash shell is that it has superb git integration. For build processes I use Gulp, although I’m finding that as I move more into the React ecosphere, Webpack is seriously drawing my interest. I read code with WebStorm; write code with Sublime Text. After getting a job and working on production code with hundreds and thousands of lines, Sublime Text would just kill me. I use WebStorm to read code, particularly large codebases. I’ve been curious about atom. Especially it’s ability to handle codebases accessed via ssh. And of course github for desktop, because sometimes i am to lazy to open terminal. 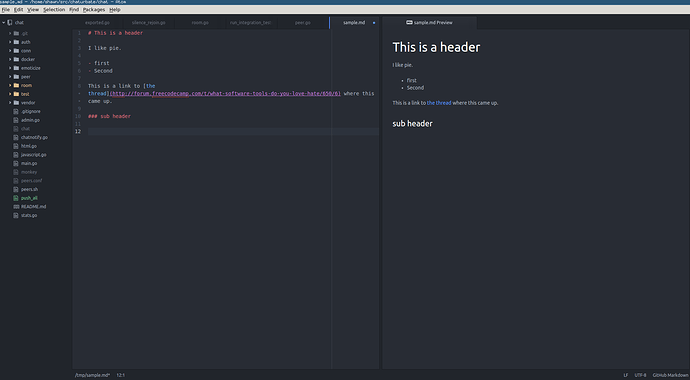 I’m a long time Sublime Text user but recently Visual Studio Code got my attention and I must say it’s pretty good. Still missing tabs which I think are a must in a code editor, and the community around isn’t that solid but I’m sure it will catch up. Also I use Wunderlist because I like lists and I got used to it, but wouldn’t mind switching to Todoist though since it looks cooler, probably will in the future.